Radiation is a form of beneficial energy which helps sustain life on our planet. But if it accumulates in a large quantity in one place, then it causes tremendous harm to Nature which takes decades to undo. Man is a part of Nature and shares in the consequences of any such catastrophe. In the case of exposure to intense radiation, serious harm results for all the body’s life-sustaining mechanisms, and the body's defence system is significantly weakened. This results in abnormalities and diseases. Up until recently medical theory held that the consequences of radiation exposure are incurable, which makes the following report all the more compelling. In 1992 a experimental research was conducted into the therapeutic effect of cold pressed pine nut oil on a group of people who had taken part in the clean-up of the Chernobyl Atomic Energy Station in 1986-1987. The group under observation consisted of 11 persons, including people with pronounced post-Chernobyl syndrome (stenisation, psychopathisation, pronounced irritability of the sympathetic nervous system). The most common complaints were: increased liability to fatigue, reduced working capacity in the latter part of the day (experienced by the whole group), sleeping disorders (8 subjects), frequent nervous breakdowns (7 subjects), recurring headaches (7 subjects). In addition, 4 persons suffered from chronic gastroduodenitis and 3 from chronic laryngotracheitis. The treatment programme lasted 30-40 days and included a daily intake of cold pressed pine nut oil in a milk emulsion of 50%. The mixture was taken in two different doses: once every morning on an empty stomach, in the amount of 1 tablespoon (20 g approx. ), and 3 times a day before meals in the amount of 1 teaspoon (7 g approx.). 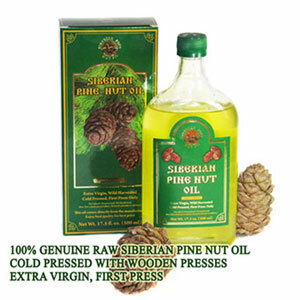 All patients reported positive results from taking the cold pressed pine nut oil. All 11 subjects noticed an improvement in their overall well-being, increased working capacity, a significant stabilisation of the nervous system and a normalisation of sleep patterns. Headaches disappeared (4 subjects) or were less pronounced (3 subjects). A beneficial effect was also observed on the gastrointestinal tract - symptoms of gastritis were barely noticeable. Bowel functions normalised. The symptoms of laryngotracheitis completely disappeared in the three patients who were suffering from this disease. It is interesting to note that during the whole time the mixture was being taken not one of the patients took ill with flu or any other acute respiratory disease. It should be emphasised that no health improvement was achieved by members of this group through ordinary medical remedies. 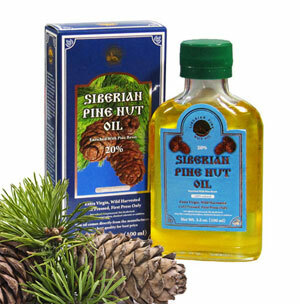 As a natural food product, pine nut oil has practically no counter-indications to its application.